We are used to looking at the road to victory as a road we must travel alone. Then it is not strange that after we finally end up on the “winners podium”, we often feel lonely. Children see victory differently. For them, victory grows with every smile they are surrounded by and every hug waiting for them after each hurdle passed. 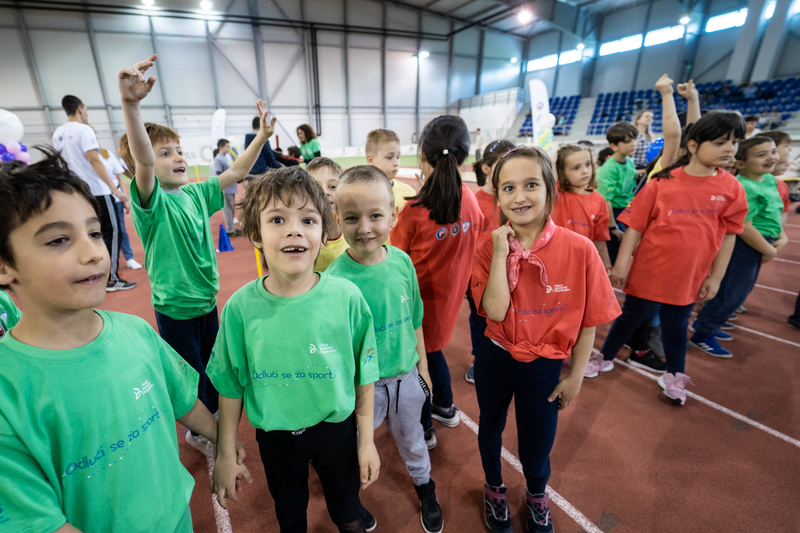 On Friday, April 5, Athletics arena in Belgrade resonated with children’s voices, shouts of support and thunderous applause. Novak Djokovic Foundation gathered more than 150 children to celebrate the International Day of Sport for Peace and Development together. It was the perfect example of how play and sport promote peace, connect people and overcome all differences between us. 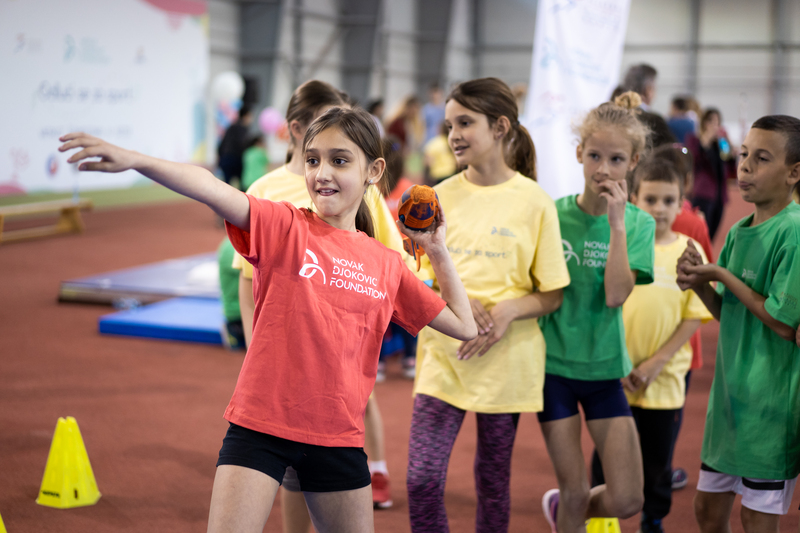 In partnership with the Athletic Union of Serbia and Sports Association of people with disabilities of Belgrade, Novak Djokovic Foundation organized an event called „Choose sports – believe in your inner champion“. Numerous sports activities were organized for the children, including long jump, high jump and relay race. It was very inspiring to see how children root for one another and applaud even when someone makes a mistake. Our “little champions” have once again shown us that we can learn so much from them. Vidak (the blond boy in the middle), 8 years old, recognizes that it is more fun to go towards your goal alongside your friends. Children recognize that if they want to achieve something, they must do something over and over again until they become good at it. They acquire this natural feeling when they learn how to read and write, when they play their first etude or when they play basketball in the yard. But the key thing is that they are not aware of this. They do not see it as labor, but rather as fun and game with their friends. “For me, victory is when you practice something, and you practice and practice and then in the end you succeed. But I love it the most when I practice with my teammates!”, says Kjara who is a member of Red Star athletics team. However, at some point, when we become older, we lose that child’s sense of ease. It’s like all the things we could lose then overshadow the things we could gain. We lose patience and we want to be immediately good at everything. We are blindly focused only on the prize and we forget that the road to our goal should be another experience that enriches our life. More than 150 children enjoyed various sports activities. On the break, we met Katarina, Ivana, and Marko. While they munched on apples and bananas, we asked them what victory means to them and what gives them strength. “For me, victory is when we participate”, said Katarina. “For me, victory is teamwork”, Ivan added quickly adding that he trains swimming alongside athletics. And Ivana said that her friends from her athletics team give her the most strength. Ivan, Ivana and Katarina reminded us all of the importance of the team spirit. Often, on the road to our goals, we encounter people who are equally good as we are. Then we experience some other feelings, such as jealousy and vanity, which only slow our personal development. It is important to set your goal at the very beginning because then you will remain focused. Remember that the point is not to be better than others, but better than yourself. Let Katarina from the Red Star athletics club serve as an example. Even though Red Star and Partizan sports clubs are known as eternal rivals in Serbia, she was especially pleased to see members of Partizan athletics club present at the manifestation. The greatest success of the “Choose sports – believe in your inner champion” manifestation, was that each kid made at least one new friend. Coaches of three major domestic athletics teams – Red Star, Partizan and Vozdovac created the exercises just for this occasion. Learn from our little champions and face the next challenge with a child’s curiosity. Don’t insist on having to achieve everything alone, but embrace the words of support from those who love you. This way, you will recognize more easily when someone else needs your help. Don’t forget – together we always finish first! What is #SportIn1Word for you?